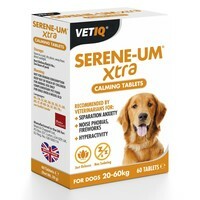 VetIQ Serene-UM Xtra Calming Tablets for Dogs are a natural food supplement to induce calmness and to soothe hyperactive and/or nervous dogs. Formulated with natural ingredients, Serene-UM Xtra helps your pet remain calm during periods of stress and anxiety, without having a sedative effect. VetIQ Serene-UM is a tasty highly digestible tablet, which can be given whole or crushed over food. Starts working 6-8 hours but for maximum effect allow 24-36 hours. Fresh drinking water should always be available. Each box contains 60 tablets. These tablets are great I have a very nervous collie/lab who is nearly 11 and the change in her behaviour is very good. I've used this produce for past 11 months and found it helps tremendously to keep my dog, a rescue Lurcher, to be more calm and affectionate.